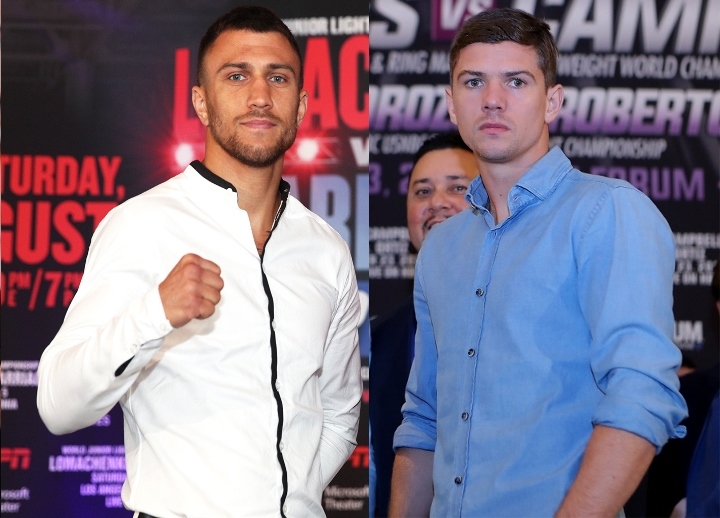 After dismantling Anthony Crolla in style, Vasyl Lomachenko could be set to face another Englishman next after admitting he would welcome the chance to fight Luke Campbell. The Ukrainian successfully defended his WBA and WBO lightweight titles in Los Angeles on Friday, stopping former world champion Crolla in the fourth round. Lomachenko had initially been due to face Richard Commey but the IBF champion withdrew from the unification clash due to a hand injury. While Commey remains an option, the fighter nicknamed 'Hi-Tech' revealed his desire to box in the United Kingdom against Campbell, who - like Lomachenko - won a gold medal at the 2012 Olympic Games in London. "It would be great, a historical fight between two Olympians," he said in his post-fight news conference. "I love the UK fans and the UK boxing people - they understand boxing. I want to come to the UK and fight Luke Campbell." Mikey Garcia is also a target for Lomachenko, though the reigning WBC champion's future at lightweight remains unclear. Garcia lost on points after stepping up two divisions to take on Errol Spence Jr last month, though Lomachenko has no plans to go above 135 pounds just so the much-anticipated fight can happen. "Everybody wants this fight," the 31-year-old, who has also won world titles at feather and super-featherweight in his professional career, said. "It depends on his size, his weight. If he can cut weight, we can organise this fight. If not, it won't happen. I can't go to 140." Promoter Bob Arum raised doubts over Garcia dropping back down the divisions after his outing at welterweight. "The man just went up to 147 pounds. Loma and myself understand boxing - if you go up and fight at 147 pounds, it is extraordinarily difficult to come down to 135 pounds," Arum said. "That's not to say it's not possible, but it’s up to Mikey. Can he come back down to 135 pounds and defend his title against Loma's two titles? That's up to Mikey." [quote=dabeasto;19657519]mikey will keep on ducking lomachenko! Strip mikey and loma easily beats campbell for the wbc[/quote] bob arum is ducking mickey!!! Bob arum does not want loma to fight mickey!! !